Okay, okay... these definitely won't win any awards for looks. But they are SO, SO YUMMY! I pinned this recipe on Pinterest a long time ago and decided that it would be a perfect little post-baby snack to add to my freezer collection. I made some modifications based on what I had on hand, and what I thought would taste good. You might even call these my version of "lactation cookies," since oats, flax seed, and coconut oil are all supposed to help a new mom's milk come in... but in all honesty, I just think they taste good! 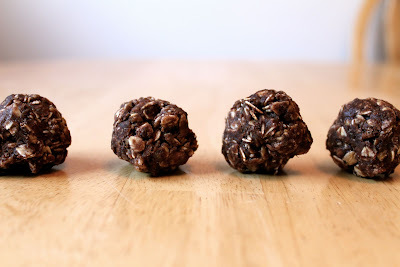 ;) These work really well both as a snack (since they're a decent source of both protein and fiber) and a pretty guilt-free treat. They remind me a lot of no-bake cookies, although less gooey and with a more complex flavor. The variations on this recipe are endless, so don't hesitate to make substitutions of your own! If my baby ends up (HEAVEN FORBID) being sensitive to chocolate, I think I'll end up making these again and skipping the cocoa powder. As much as I adore them the way they are, I suspect they'd be pretty good as peanut-butter-bites too! Combine oats, cereal, flaxseed/flour, and cocoa in a medium mixing bowl. In a smaller bowl, melt coconut oil in the microwave and then stir in peanut butter and honey. Add this to the dry mixture and mix with a spoon until everything is integrated and just moist enough to hold together fairly well (this takes some patience). Refrigerate for about half an hour to firm up the mix, and then use your hands to press into small balls. Store, covered, in the fridge. (To freeze mine, I laid all of my cookie bites out on a cookie sheet and flash-froze them, then transferred them to a plastic freezer bag. When I'm ready to eat them, I'll probably either pull a few at a time out and let them thaw for half an hour or an hour, or else I'll take the whole bag out and store them in the fridge instead.) Post update: Actually, it turns out these are fantastic straight out of the freezer. And, um, I'm just sayin'... they may not make it to be postpartum snacks, after all! Maybe we can consider this batch "end-of-pregnancy sanity savers"??? Michelle, typically in recipe shorthand a capital T is a tablespoon and a lowercase one a teaspoon. :) So in this case, a tablespoon cocoa. You could sub out the flaxseed for anything you liked that had a similar consistency. I ran out making my first batch, so in my second I used whole-wheat flour. You could also use oat flour, oat bran, wheat bran, wheat germ, etc. Basically, it's just a finer grain/flour type thing to hold everything else together! Enjoy! Cindy, where do you find coconut oil? Is it pricey? I buy it on Amazon. (The exact product I buy: http://www.amazon.com/gp/product/B003OGKCDC/ref=rcxsubs_mys2_product_title) It's somewhat pricey, but it lasts a LONG time. I also use it for my cleanser and sometimes for a skin moisturizer, and it's way cheap for those things (in comparison to buying them from the store)! I do the amazon subscribe and save and get the big 32 oz thing a few times a year... it takes me SEVERAL months to use it up, and that's with using it a lot for skin care.